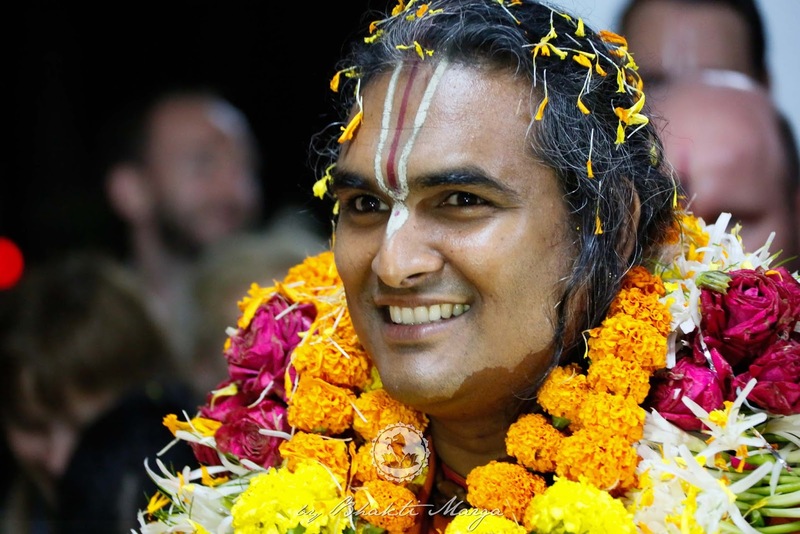 Sri Swami Vishwananda becomes first ever Germany-based spiritual leader to hold prestigious title of Maha Mandaleshwar. 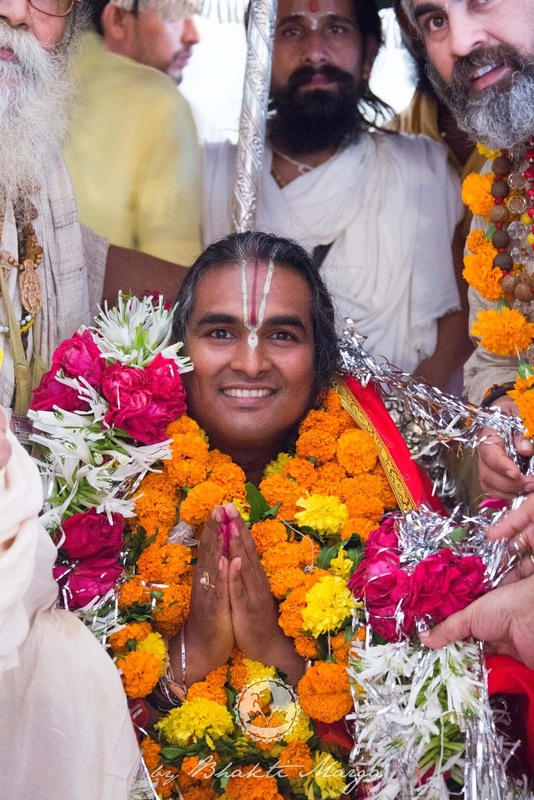 SPRINGEN, GERMANY, 29 September 2015 — Resident of Heidenrod-Springen in Hessen/ Germany, Sri Swami Vishwananda, returns to his home ashram near Frankfurt after receiving the title of Maha Mandaleshwar, one of the most prestigious titles given to Hindu spiritual leaders. Sri Swami Vishwananda was acknowledged by all four heads of the Vaishnava Sampradayas (spiritual lineages), a very rare and special honour, as well as the hundreds of sadhus (Hindu holy men) and over 125 devotees from Bhakti Marga, his international spiritual organisation based in Germany. The ceremony took place in Nashik, in the Indian state of Maharashtra where this year’s festival was held this month. A Maha Mandaleshwar (meaning superior of many monasteries) is considered to be a guardian and pillar of the Hindu faith, presiding over several ashrams and temples and the title recognizes significant spiritual achievement and leadership. The title originates from the 9th century and was established by Adi Shankaracharya. At the time India was under religious threat for the first time and so in order to safeguard the religion and its customs, Akharas (spiritual armies) were formed. Those Akharas of which today there are 14 have developed over the centuries into spiritual institutions tasked with preserving and propagating moral, cultural and spiritual values into society. 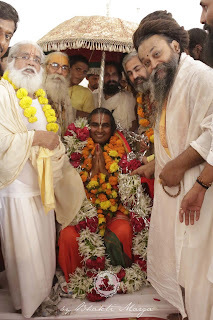 Sri Swami Vishwananda was initiated into the Nirmohi Akhara, a Vaishnava Akhara founded in the 18th century with its headquarters in the city of Ayodhya, India. Its leader, Mahant Sri Rajendra Das was also present at the initiation. Over the past 10 years, Sri Swami Vishwananda has travelled the world to spread the message of love, patience and unity, and the importance of opening one’s heart to a personal relationship with the Divine. 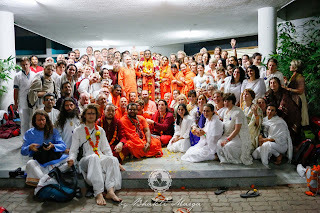 Sri Swami Vishwanda’s recognition by the Akharas is therefore even more special as he has predominantly operated outside of India, educating those who are new to Hinduism and its deep spiritual tradition. "I am thankful to the entire fraternity of sadhus for conferring this title on me. I will spread the message of love through Bhakti Marga everywhere," said Sri Swami Vishwananda. 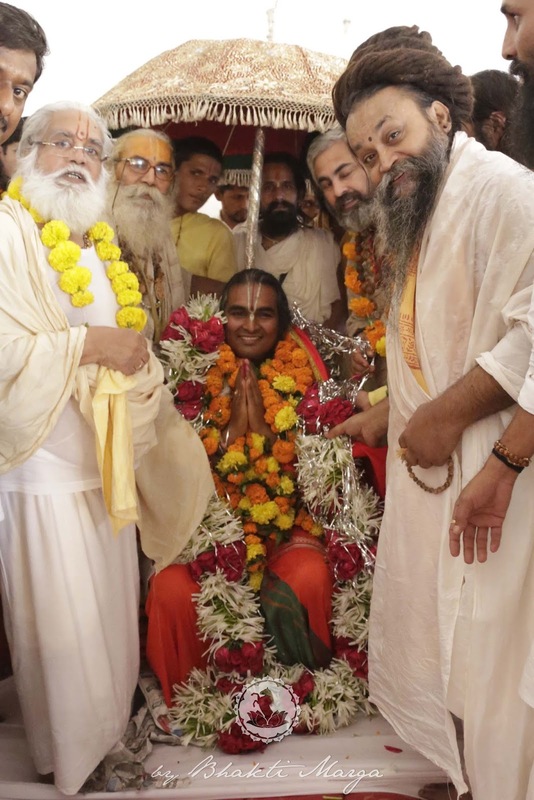 As a Maha Mandaleshwar, Sri Swami Vishwananda has now been conferred, amongst many other things, a greater responsibility in sharing the message of Hinduism and spirituality and places him amongst the foremost figures of Hinduism. The title grants him the possibility to reach many more people than ever before and it marks a turning point for Sri Swami Vishwananda’s mission in India, as he looks to spread his divine message across the globe in an effort to uplift mankind to love unconditionally. The initiation ceremony took place during the famous Kumbh Mela, the world’s largest spiritual festival, where millions of Hindu devotees gather on average every three years to bathe in four of India’s holy rivers. 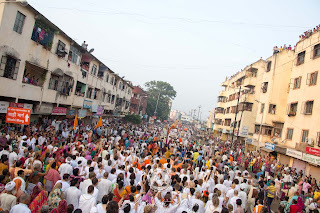 The Kumbh Mela, literally translated as the festival of the holy pitcher, is a tradition that dates back thousands of years, in which Hindus believe that the Gods spilled drops of the nectar of immortality from their holy pitcher on to the four locations of Haridwar, Ujjain, Nashik and Allahabad. It is undoubtedly the most important pilgrimage for Hindus as the holy waters cleanse away all impurities and give new life and hope for the millions of believers striving for divine fulfilment and perfection. The last Kumbh Mela was attended by approximately 100 million Hindus making it the largest human gathering in the world. Sri Swami Vishwananda and his group of over 125 pilgrims from over 30 countries were in the public eye as the only predominantly western group to participate at this year’s Kumbh Mela, further showcasing Sri Swami Vishwananda’s extensive work to open up previously closed doors to the western world, granting devotees the possibility to participate in these deeply spiritual pilgrimages regardless of cultural background. The group received extensive local, national and even international press coverage. A Mauritian of Indian origin, Sri Swami Vishwananda founded his mission Bhakti Marga in 2005 with the principles of love, patience and unity. Based in Springen, just west of Wiesbaden and Frankfurt, the main international spiritual centre and ashram Shree Peetha Nilaya, which means “abode of the Divine Mother”, hosts meditation courses, spiritual events, and annual festivals. This past July, the organisation celebrated its 10th anniversary with 2000 guests from all over the world. As of September 2015, over 1’000 spiritual groups inspired by Bhakti Marga are active in 50 countries around the world, with a special focus on Europe. Bhakti Marga is opening its first ashram in India in April 2016 in Vrindavan.